Going to an art gallery at 11 am is like going to a movie at lunch time : the faint guilt that you feel doubles the pleasure. 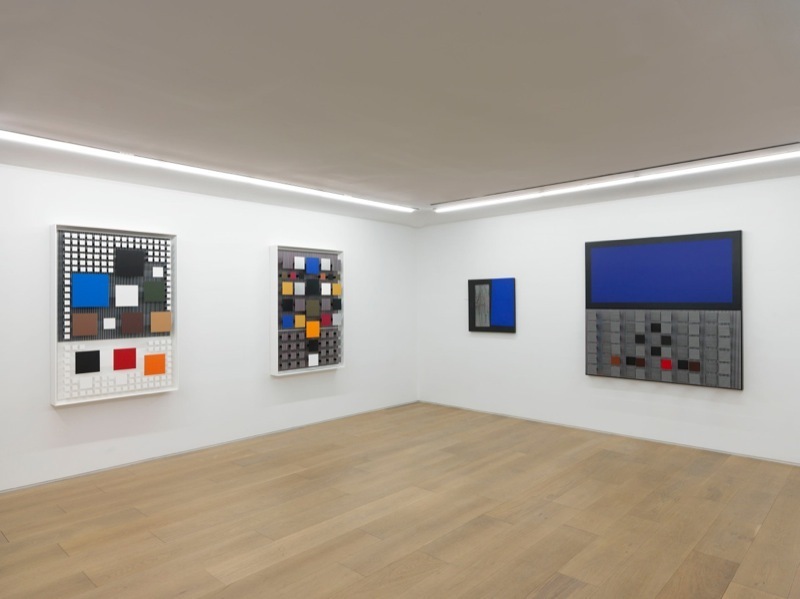 This time, I went to see the Venezuelan Jesus Rafael Soto «Chronochrome » (kinetic exploration of the monochrome) show curated by Matthieu Poirier at Galerie Perrotin. I went to the Paris one but it also shows in New York until Feb 21 st. I realised in front of the amazing « Seis planos vibrantes » that two days ago, the painting/sculpture that tickled my neck at my friends the B’s dinner party, was a Soto ! very unconfortable if the couch is to close…Wouah ! I had been excited by it and also intrigued. The eye is « trapped » by the movement of these still paintings and the experience of wandering around the three floors of Galerie Perrotin is magical. I ran into two tax exile sets of friends who shared my enthusiasm. What a beautiful way to start the day. As I wandered rue Charlot, I was, by chance the first one to buy the new issue of Egoiste in a little photo gallery of the Marais where a stack of them were still lying unwrapped. Nicole Wisniak’s magazine creates a little turmoil every time it comes out, which is every few years at no specific time. Let’s assume she wanted it out for this week’s Spring/Summer couture collections which attract every six months the cream of the cream of fashionistas to Paris. 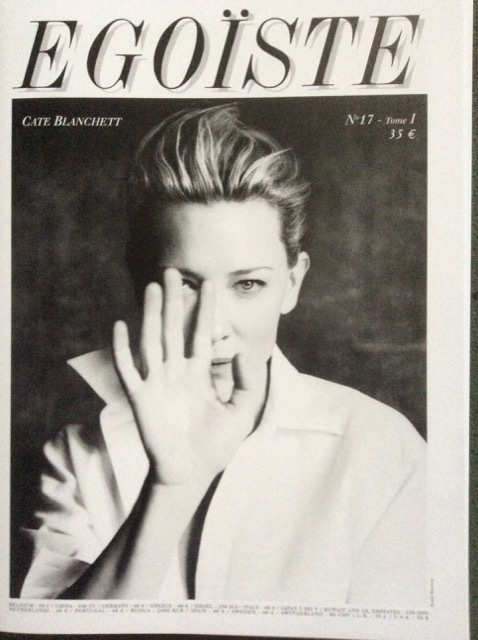 Cate Blanchett on the cover of course, WHO ELSE ? since her huge success and Oscar for her part in Woody Allen’s « Blue Jasmine », Cate is everywhere, on stage, on multiple adds, on three continents. A hilarious series of photos inverting the heights of famous men : Sarkozy much taller than Obama, Scorsese much taller than Tarantino. The effect is fun ! Italian artist Beatrice Caracciolo shows her photographs of ruins and her daughter Saskia de Rothschild, who has a new novel out, writes about books turned into films. Anselm Kiefer is interviewed by Adam Gopnik. Kristin Scott Thomas shot by Gilles Bensimon acts as the wife and as the lover of five different kinds of men : these hilarious ten photographs are the big winners of the issue ! and confirm Scott Thomas as a genius chameleon. Charlotte Casiraghi’s beautiful pictures par Paolo Roversi are also a pleasure to enjoy. None of the photographers nor writers are very young. They are all friends of the editor and belong to the generation that made French Vogue so unique in the 80’s . The origniality of Egoiste is that all the ads are shot especially for this issue and are beautiful including Jeanne d’Arc carrying her Vuitton bags on her horse or one of the Caryatide statue stepping down from l’Acropole. Bravo Siegfried and Nicole, this 17 th issue is a winner ! Where would I find one to buy today? Bravo Laure. Quelle bonne idée de nous faire partager ton gout de la découverte ton enthousiasme et ton talent. tu nous apportes des excellants informations sur la vie culturelle en france et a londres maintenant aussi..ton blog esttres tres bien, bravo et merci!! jai tres envie de voir cette exposition chez perrotin maintenant et de voir la piece! oooh! Keep a copy for me so I can read it when I come to visit! Bravo chère Laure pour ces nouvelles parisiennes écrites avec piquant et humour! Quant à Egoïste comme toi j’ai toujours aimé leurs publicités exclusives. J’ai même eu la chance d’en faire une pour Hermès en 1985/86 ou 87 (je ne me souviens plus exactement) où je marchais le long d’une route avec un sac de voyage; la ligne sur la route était un bolduc Hermès!